This is a guest post by Hallan Turrek from A Merry Life and a Short One. One of the four beasts said, Come and see. Welcome to the second installment of CrazyKinux's Ship Fitting series. Last week, Kirith Kodachi covered PvE fittings for Rifters and Breachers. This week I'd like to do the first of what will probably be many PvP fitting posts. I'll be covering Stealth Bombers. Most people are unsure as to the role of stealth bombers in a gang. What you have is a highly mobile and cloaked piece of artillery, for better or worse. You can hit at range and hit hard. You can warp cloaked and sit in a safe cloaked. You decide when to engage and when not to engage. As long as you use it wisely, you will very rarely die. These are not a ships for the faint of heart. That's about 90 days of training if you're starting with a new character. Everything on there is worth it though. Next up is the list of Stealth Bombers. Now I fly all of them, but you'll likely be training up for just one. I fit mine all with the same concept in mind. Range, not damage. You will see no bomb launchers. You will see a damage control. 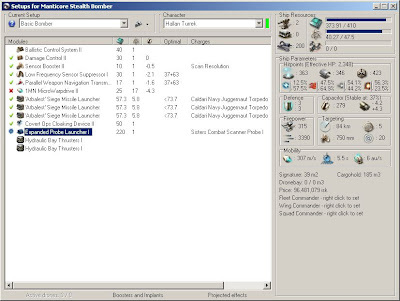 You will see an offline expanded probe launcher. You will see a missile range of 73.7 kilometers. The lowest targeting range is 72 kilometers. The DPS is identical for each build. Pick the one you'll be flying out of the list, and we'll start talking about why I fit it that way below. The Amarr Purifier has the lowest targeting range of any of the bombers you can use with my builds. It actually starts out with better range than the Hound, but given the small difference between it's targeting range(72) and it's missile range(73.6), I chose to not worry about it. Because of it's EM damage bonus, this is an especially effective Bomber against Ravens, Drakes, Falcons and Rooks. If it shield tanks, it's likely to have an EM hole, and no matter how well they plug it, it's probably going to be the lowest resist. This is especially useful when going after ratters in places that deal Explosive and Kinetic damage. Be sure to load Mjolnir Torpedos! The Gallente Nemesis is a ship I have not gotten much use out of. I prefer the Manticore for multi-purpose damage, but the Nemesis is a solid choice. Thermal is usually a better choice for when you're unsure of what you're going to face than Kinetic, Explosive, or EM. This will still give shield tankers a rough time, but not nearly as much as the Purifier. It will probably do at least decent damage to armor tankers as well. 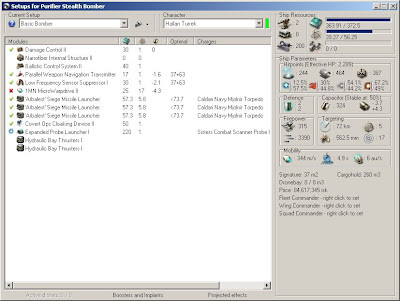 For the build I've given you, the sensor booster can be switched for another target painter if that's your preference. I prefer to lock faster if I can. Be sure to load Inferno Torpedos! This one's only kinda tricky to fit for range, eventually I settled on a tech 1 signal amp in the lows. The Minmatar Hound is pretty fast for a bomber, but that makes it pretty damn slow for a frigate. It gets a lowered targeting range in exchange for it's increase in speed. The signal amp kicks the targeting range over the needed threshold and then some. Any armor tanking ships that you run into should have a bit of trouble taking damage from this sucker. Especially if they're armor tanking NPC's that shoot EM and Thermal. Be aware of your situation. You can take that Signal Amp out if you decide to fit for damage instead of range, but not much else will fit in there. Due to CPU being tight, this uses a named MWD. Be sure to load Bane Torpedos! Finally the Caldari Manticore. It has more targeting range and CPU than you'll have any use for, but I find that extra wiggle room to be useful. Once again I opted for a sensor booster for faster locking, you may switch that for a painter or a damp on this ship because of it's excess of CPU. If you're trying to decide which bomber to use, this is probably your best choice. It's damage is multi-purpose and it comes with a few built in advantages Just be sure to load Juggernaut Torpedos! Some of the items are optional. One could switch out that damage control, switch a few other things around and cram an extra ballistic control on any of those ships if they so wished. You can switch out the range rigs for damage rigs. You could go all painters on some of them or all damps on others. One of the reason I chose to use range increasing rigs is that it increases my survivability. I have ample time to run away from anything chasing me. I'm near the edge of point range for even the longest range overloaded points. I'm outside immediate targeting range of most of my targets, and those that can get me targeted get a face full of range dampening. If no one's targeting me... I can cloak at will. The sacrifice is DPS. Compared against a similar ship rigged for damage you won't get top DPS, but you'll survive the battle every time if you play it smart. Some smart EFTer will look at those builds and note that you can get slightly increased range from mixing a flight time rig with missile speed rig. I prefer missile speed rigs because it increases the range of my torps while still allowing mine to hit at the exact same time as the bomber that shoots at 54 kilometers. The damage control is a personal fitting requirement. Your choices may vary, but I've gotten good things out of it. It's saved my bacon a couple of times and it will for many more encounters. Why a range damp? With this setup it is absolutely a must. The benefits of using one range damp at normal bomber range is minimal, but at this range you'll be able to remove a threat. Why a painter? Easy enough, a painter increases the signature radius for the ship you're shooting it at. Torps were meant originally for Battleships to use, and as such do horrible damage to smaller ships. Stealth Bombers get a bonus to make them do a bit more damage to smaller ships, but you'll still run into some problems. Using a painter works wonders in increasing your damage. Why a microwarp drive? If I kick that on and get hit by missiles I'm toast, right? Yeah you will, so don't do that. If someone shoots a bomb, or lets missiles of any kind fly at you, just move. Fly in a direction, preferably aligned to a planet. Do not activate that MWD. On the other hand, if you've warped to a gate at 70 kilometers expecting a fight, but the guy jumps through and your fleet is in pursuit, it's easier to just burn hard to the gate and go through(and once through, easy to burn away from the target). It's easier to set up your safe spots off gates. The MWD should almost never be used in combat unless you've landed way to close to something and it's decloaked you. Why best named torp launchers instead of tech two? Skill requirements to start with. Also fitting requirements. 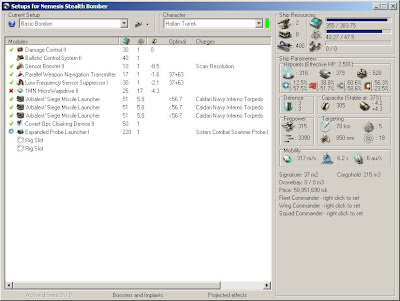 You'll note that tech two torp launchers take alot more CPU than the Arbs. Unless you're flying a Manticore, they're almost not even an option. Just remember: if you have to drop a Ballistic Control Unit to fit tech two launchers, it might not even be worth it. The DPS of the faction torps is very nice. Why not best named sensor damps and painters? Cost. You gotta keep your costs down. You will lose this ship sometimes. It's best to understand that now. I've lost it to a smartbombing gatecamp and warping down on a friendly bubble while a battle was already engaged. It stung. Lower costs whenever possible. The next best named modules are literally almost as good. Use them instead and save ten million. Why an offline expanded probe launcher? This was not something on my original fit. I used a core probe launcher for a bit, then switched to a small armor rep for 0.0 work. It came to me that sometimes we needed a combat prober. If you're doing 0.0 work, you want an out, and core probes will find you a wormhole eventually. That makes you a mobile resupply point. Find a WH to highsec and let your corpmates know. You'll have to offline a lot of stuff to get it working, but once it's online probing a logoffski is a snap. Your gang will love you when you just happen to have this at the right time. Remember, a bomber can warp cloaked. There is no reason not to cloak as you align to warp from gate to gate. Just hit warp, then cloak as soon as gate cloak dissapears. You can do cloaked scouting easily as well. Just be wary of bubbled gates in 0.0. When in combat, I prefer to orbit my target at 65 kilometers, adjusting as necessary. If you start way inside or way outside of where you want to be, uncloak and microwarp drive to where you want to be. Make sure to turn it off when you're done. Also be sure to activate your modules on the target(assuming he doesn't have inactive drones around him). Even if he has drones, once you're out to your max range, you'll be outside of his drone control range. Just be careful, there are rigs and modules that increase that drone control range. You still ought to be able to warp out before they kill you. Just be watching. Use your modules properly. If you're primarying a Myrm that just won't die, and a Raven lands on grid with intent to violence your boat, do yourself a favor: take the range dampener off the Myrm and put it on the Raven. Have operational awareness. Heavy Assault Cruisers are something you must watch for. A zealot will mess your day up instantly if he's fit for range. Get him damped, if there is more than one, rethink decloaking. Any HAC set up for range can murder you very quickly. Make sure to load some other damage types into your holds. It's fine to carry mostly what you're bonused for, but sometimes you'll hit some serious resistance problems. Just watch that damage. I suggest you have fun in the ship as well, cause if you aren't it's a waste of time. Did you actually get this far? Alright, thanks for reading. Thanks to CK for thinking up this crazy idea. If you find it useful, make sure to let me know. Nice article and layout of all the stealth bombers in game. I was wondering though, why did you not discuss bombs. I know you can only use them in 0.0, but they lay down an awesome amount of damage across a 15km area, very useful and extremely dangerous if you have a gang of Stealth Bombers out and about. "You will see no bomb launchers. " Ack! How can you write an essay on Stealth Bombers and not discuss bombs beyond this line? I agree with using range rigs instead of damage rigs. And, I like the idea of using a probe launcher, but bombs are also very strong when used in fleet ops with other bombers. I am wondering what do you need to offline to get that probe launcher online? It uses 220cpu? Nice approach for low-sec, though! Nice article, very helpful EFT info. I hope CK can bring a complimentary SB specialist who is an expert at bombs. My corpmates use bombs in WH to scare off invaders who are gathering at a WH. This is highly effective! Me, i would like you to talk us through a hunt and kill. What you saw, what you did and why the decisions were made. I appreciate the throughness of your article and perhaps you might invite someone else to speak to the bombs if you are not comfortable with them. You wrote what you meant to and did it very well. Well yeah, this is a fitting post. Not a complete guide. It's not comprehensive either, as I've used bombs just enough to know I don't want to use them. Puts me too close to the target. Wow, bad fits for any of the work i use bombers for. Forget range, you only need it on POS drops, forget sensor damps, SBs are not solo pwn mobiles with torps. Fit a point. ALWAYS FIT A POINT! TP is a must yes. Bomb frigates and cruisers, most frigs will die to one Hound run, as do a large chunck of inties becuase most intie pilots hit that WMD and then they simply die taking the full brunt of the bomb. Go out in packs of around 10. ANY BS/BC will die in seconds to a experienced bunch of SB pilots using just torps and of course with a point they will not get away. Oh and points are awesome for using against haulers even if solo, or barges. To make the point (haha) again, fit a POINT! I'm not going to say you're wrong. You fly 'em your way, I'll fly 'em mine. I'll just lose mine a lot less than you lose yours.